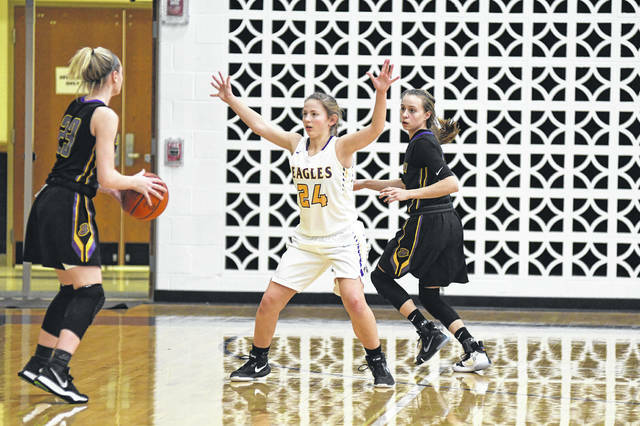 Eaton’s Anna Black plays defense, while Annika Gels looks on, during the Eagles game with Bellbrook on Thursday, Jan. 17. Eaton struggled to score and came up short, falling 43-21. Eaton’s Allison Mowen (24), Bailey Shepherd (10) and Becca Mowen (31) play defense during the first half against visiting Bellbrook, on Thursday, Jan. 17. Eaton held Bellbrook to just 12 points in the first half, but came up short in the end, falling 43-21. 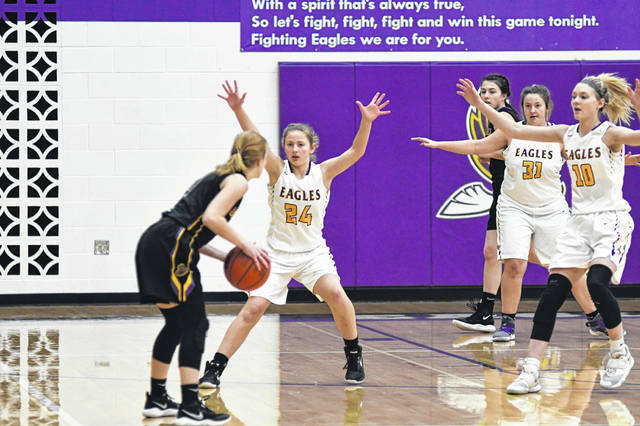 EATON — Despite holding Bellbrook to 43 points, a season-high 30 turnovers and a 29.6 shooting percentage proved to be too much for Eaton’s girls’ basketball team to overcome. 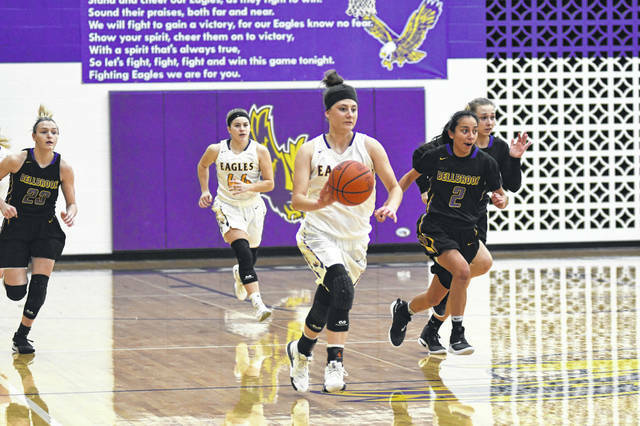 Eaton held a 13-12 halftime lead, but Bellbrook limited the host squad to just eight points in the second half to claim a 43-21 Southwestern Buckeye League Southwestern Division win on Thursday, Jan. 17. The game was originally scheduled for Saturday, Jan. 19, but was moved up due to the incoming snow storm. “I was pretty pleased with our defense for most of the game. Through the first 20 minutes we held Bellbrook to 18 points. I didn’t think our defense was as strong over the last 12 minutes, but if you’d said before the game, they’d only score 43, I think we would have taken that,” Eaton coach Dave Honhart said. 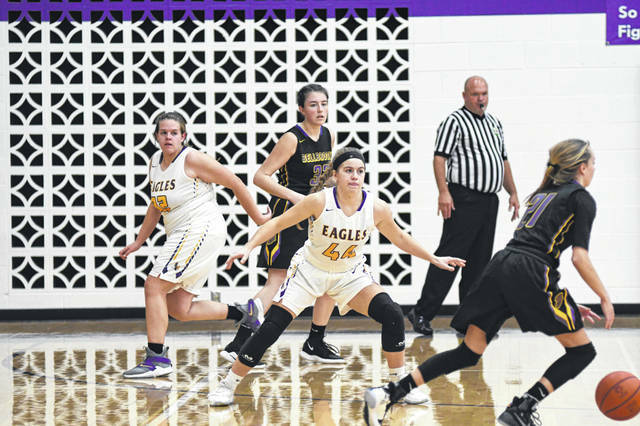 Bellbrook didn’t shoot much better than Eaton, but the visiting Eagles grabbed 16 offensive rebounds to offset their off shooting night. Eaton grabbed an early 5-0 lead and led 11-5 on a Kylee Pitsinger basket with 1:35 to play in the first quarter. Despite not scoring again until there were 51 seconds left in the first half, Eaton held the halftime advantage. Bellbrook seized control of the game in the third quarter, outscoring Eaton 17-2, to take a 29-15 lead into the final quarter. Eaton attempted just two shots in the quarter, while committing 10 turnovers. Eaton, which was just 8-for-27 from the field, was led by junior Bailey Shepherd’s 11 points. She also had five steals and three rebounds. Senior Annika Gels had four points and five rebounds. Senior Emily Dungan tossed in four points and had three rebounds and two steals. Senior Becca Mowen had five rebounds. Eaton was scheduled to play at Edgewood on Monday, Jan. 21, but the game has been rescheduled for Thursday, Jan. 31. Eaton (6-9, 2-7 SWBL) is scheduled to host Franklin (11-3, 8-1) on Thursday, Jan. 24 and will travel to Valley View (12-4, 6-2) on Saturday. “This week we get to go against the two teams at the top of the league standings. It is a great opportunity for us to compete against the best, see where we stand, and try to pull off an upset or two,” Honhart said. 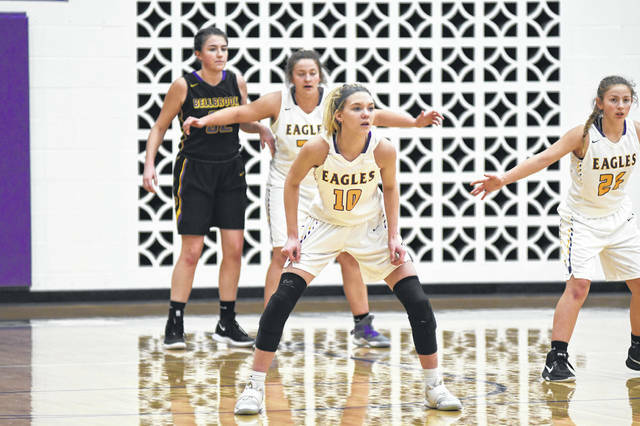 https://www.registerherald.com/wp-content/uploads/sites/41/2019/01/web1_ehsgbk1-2.jpgEaton’s Anna Black plays defense, while Annika Gels looks on, during the Eagles game with Bellbrook on Thursday, Jan. 17. Eaton struggled to score and came up short, falling 43-21.
https://www.registerherald.com/wp-content/uploads/sites/41/2019/01/web1_ehsgbk5-1.jpgEaton’s Allison Mowen (24), Bailey Shepherd (10) and Becca Mowen (31) play defense during the first half against visiting Bellbrook, on Thursday, Jan. 17. Eaton held Bellbrook to just 12 points in the first half, but came up short in the end, falling 43-21.